For me, it was the world-building in the first few pages that set me off on a rage. I'm not usually someone who fixates on the details but Christianity the main religion of the nation? A moral statute devoted to making people wear uniforms? A (future) statute for girls, forbidding them from studying math? What? In my mind, there are two types of dystopias. There are the alternative society types (i.e. The Hunger Games, though it says it "lies in the ruins of North America," or Divergent) and then there are "realistic," futuristic ones. This one would fit under the realistic type, given that it still occurs on Earth and assumes that the U.S. existed at some point and that this is what happened to the U.S. after an indeterminate period of time. So then what's the point in preventing girls from studying math? What does that have to do with anything except to make the society seem harsher? How on Earth did society get to be this way? I feel like dystopias these days add in all these details to "shock" the reader, that there's always some vague mention of a "War" (in this case, there are also some mentions of Chicago being bombed! ), and none of these adequately explains to me why we've degenerated to such violence. If it's an alternative society, so be it. For some reason, it happened. I don't need the reason... But if you want me to suspend my disbelief about this happening in the future to our society as it stands, then don't add in unnecessary details.... 'Cause by page 30 of Article Five, I was really annoyed. What's sad is that the world-building was what drew me to the novel. I really liked the idea of the Bill of Rights being revoked. I can actually picture that happening at some point. Surveillance measures have wormed their way into society, and there are some seriously questionable laws right now like the Patriot Act. What's one step more into having a stricter version of the BoR? Then I realized the other low point of the book. The plot. The plot reminded so much of the plot in Shatter Me. Nothing really happens except that Ember and Chase argue a lot while they're on the run, sometimes encounter obstacles that allow Kristen Simmons to divulge more details about her world, and then manage to escape again after something drives a wedge between Ember and Chase. I didn't like that plot in SM and I probably wouldn't have liked it in Article Five, had the world not bothered me as much as it did. The author's writing was fine. 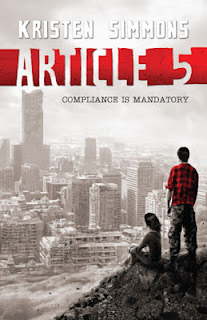 I definitely would be willing to give her another chance if she wrote a different type of story... but as it stands, the romance couldn't make up for the issues I had with the dystopian world and plot of Article Five. Oh, Christina. I love your reviews so much. I feel like they're some of the only ones that dovetail with my own opinions of books. I haven't had a chance to read Article 5 yet, but what you've pointed out definitely would have annoyed me, too. I probably won't pick this one up, but mostly because I'm exhausted with the dystopian genre. I'm so sad about this because I thought this book sounded really good! But yeah, I hate unexplained world-building and the plot of Shatter Me really didn't appeal to me, so I'll probably skip this one.